Since there was still some faux steele contact paper, I used it as my background for this card. The two circles were cut using the new Originals Dies for the Big Shot. They will premiere in the Stampin' Up! Occasions Mini Catalog on January 4th. The LOVE stamp is from the Filled With Love Promotion. If you would like to see how to make your own Designer Series Paper (DSP) which I used for the 3" circle in the card above; I have a tutorial on my blog HERE. 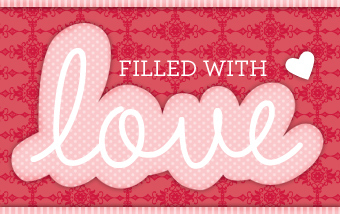 The Filled With Love Promotion runs until January 24th. I highly recommend ordering early tho so that you have time to make your Valentines and don't feel rushed. 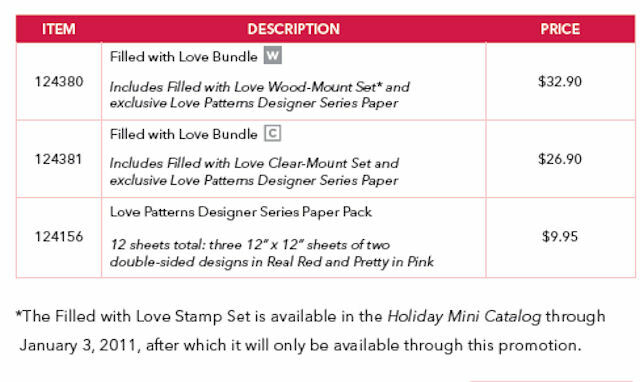 The stamp set and DSP (Designer Series Paper) in the promotion is GREAT for Valentine's Day, Anniversary, or even a wedding card. Truly a versatile stamp set. The hearts were stamped with Real Red Classic Ink, then punched out using the Full Heart Paper Punch. The Stamp-a-ma-jig played an primary role in creating this card. The background design was created by stamping numerous pendant designs lining them up using the Stamp-a-ma-jig. I'm so pleased with this creation. I think it looks like designer paper (but I created it myself). The pendant, candle, and Happy Birthday designs are from the Party This Way stamp set from Stampin' Up!. I was thrilled to realize that the candle was a perfect fit for the Word Window Punch. I accented that with the Modern Label Punch. Flames were colored with Stampin' Up! Watercolor Pencils. Party This Way - A Stampin' Up! Stamp Set. It could be used for any type of party, but in my card above I used it as a birthday card. Did you notice the 3 1/2" and 3" circles???? They are from my blog post from the other day (Sneak Peek from the Occasions Mini). I did use a Uni-Ball White Gel Pen to created the ties with strings for the balloons. Just a reminder that the Stampin' Up! 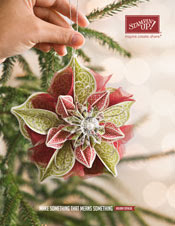 Holiday Mini Catalog ends January 3, 2011 (that's one week from today). Don't miss out on the items you want/need from it by ordering now. You can view the catalog on-line, here's the link. There is still time too to have your name entered in the drawing for a FREE copy of My Digital Studio. All you need to do is place an order thru me/my website by the end of this month for a chance to win. MORE DETAILS HERE. Drawing will be on January 1, 2011. Wouldn't it be GREAT to start out the new year with your very own copy of this wonderful Stampin' Up! product. Drawing is open to US customers only. Stampin' Up! US Demonstrators are not allowed to sell outside of the US. Stampin' Up! Big Shot Items Sneak Peek - Do you need a catalog? I'm always excited when new Big Shot items are offered thru Stampin' Up!. Lots of new exclusive items items in the Occasions Mini Catalog that will premiere January 4th. These photos are of the newest Sneak Peeks!!!!! Above is a photo of the die-cut images from the BigZ L Die called Fun Flowers. The die cuts 5 different shapes. The largest flower (on the left) is approximately 3" at the widest point and the smallest (on the right) is approximately 1/2" at the widest point. I used the Fun flowers on this layout too. Every other layer I embossed with Perfect Polka Dots Textured Impressions Embossing Folder (item #117335) from the main catalog. Did you notice the Sneak Peek item???? The Framed Tulips (background piece) is a Textured Impressions Embossing Folder and is in our Occasions Mini Catalog. Perfect for a card front. I had fun playing with different scraps of card stock to create the above flowers. All layers were cut using the Fun Flower BigZ Die. Again this is a Sneak Peek item. Two final Sneak Peeks for today ... We now have a 3 1/2" and a 3" Circle Die for the Big Shot. These are Original Dies and are exclusive to Stampin' Up!. Now I need to make these into cards, but I had to show you them first. I'm so pleased with the new products. All my customers should have a copy of the Occasions Mini and Sale-A-Bration Brochure by the end of the month. If you are NOT on my mailing list already, drop me an e-mail with your name, address and valid e-mail and I will send you a copy of these new catalogs. Please do not leave personal information in the comment section here. 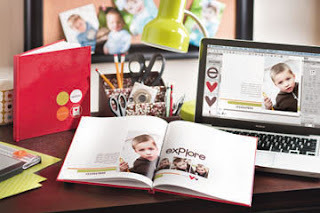 Don't forget about the Chance to Win a FREE copy of My Digital Studio just by placing an order thru me for Stampin' Up! products. Full details HERE, it will end on December 31, 2010. I'm sending BIG WISHES to all of you. I hope that you have a very Merry Christmas surrounded by family and friends. The horses are from the Stampin' Up! stamp set called Pony Party, item 115217. I used a 1" circle paper punch to punch out the head area. Then I accented it with Elegant Eggplant Card stock that was punched out using the Scallop Circle Paper Punch. Stampin' Up! colors used for this card: More Mustard, Whisper White, Elegant Eggplant and Early Espresso. Created a unique border across the top of the card by stamping images from Circle Circus Stamp Set then using a 1 inch circle punch to punch them out. Like the layering and texture it adds to the card. The horse, grass, butterfly and sentiment is from Pony Party Stamp Set. This stamp set has a stamp to add wings or a horn to make the horse a unicorn. Circle Circus, item #115778 - wood only. Circle Circus is one of my favorite stamp sets. So much that you can do with it to accent, to design, and to add to your paper craft projects. This card was done in Stampin' Up! colors of Tempting Turquoise, Whisper White, Old Olive, and Rich Razzleberry. The combination of Pretty In Pink and Elegant Eggplant added to the feel of elegance for this card. I absolutely LOVE purple and Elegant Eggplant from Stampin' Up! is no exception. It is such a rich and deep shade. I use it often with the cards that I make. Decided to do a watercolor card today. I used Stampin' Up! 's Watercolor Wonder Crayons. So easy to use with our Blender Pens or Aqua Painter. I used the Aqua Painter on this card as I like it better for painting in larger areas. Very pleased with the results and the combination of Bashful Blue and Marina Mist card stock. Dont' forget that any purchase you make through my website or me, will qualify you for a "chance" to win a FREE copy of My Digital Studio. More Details HERE. The flowers on the left were stamped, then coated with Crystal Effects. Crystal Effects adds a dimensional, lacquered look to any stamped image. It is acid free and comes in a 2 oz bottle. 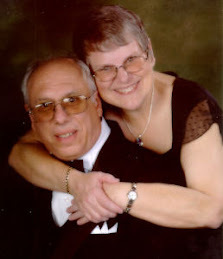 This year Sale-A-Bration will run from January 25th thru March 31, 2011. The Happy Birthday Stamp is from the Punch Bunch Stamp Set in the Sale-A-Bration catalog. The Glimmer Paper is from the Occasions Mini and will be available as of January 4th. Sneak Peek - Build a Cupcake Punch from Stampin' Up! In our new Occasions Mini that will premiere on January 4th, we will have a paper punch called Build a Cupcake Punch. The cupcake in the card above was made using this punch and different colors of card stock. This paper punch also matches a new stamp set called Create a Cupcake (not shown here). I also accented the card using our new Glimmer Paper (Sneak Peek). The paper is a perfect match to the Glimmer Red Brads in the Glimmer Brights set. Glimmer Brads are in the Holiday Mini now and also will be in the Occasions Mini. The Filled With Love Promotion (Stampin' Up!) started yesterday and will run thru January 24th. This is a great bundle for making your own Valentine's. I highly recommend ordering as soon as possible to be guaranteed you have plenty of time to make your cards this year. 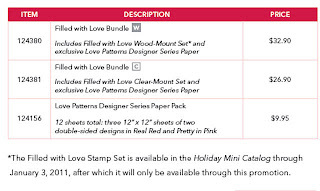 Be sure you order with the appropriate bundle number so that you receive the FREE package of Bitty Buttons when you purchase the Love Bundle which includes the Love Stamp Set and the exclusive Love Patterns Designer Series Paper Pack (which is only available thru this promotion). The card was made using Real Red, Pretty in Pink, Whisper White and Love Patterns card stock. Whisper White Craft Ink and Real Red Classic Inks were also used. This is the inside of the card with the buckle opened up. You have room for a handwritten note inside for that special person in your life. Filled with Love Bundle, item #124380 - Wood Mount OR #124381 - Clear Mount. Stampin' Up! just posted a video for a hybrid project using My Digital Studio. Video can not be viewed via e-mail, but can be seen on my blog. I have a number of hybrid cards on my blog, really enjoy using digital and traditional together. Love is in the air ... thanks to a brand new promotion sponsored by Stampin' Up! 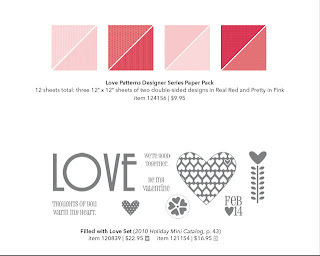 Details: Valentine's Day is the second biggest holiday for sending cards, and during the Filled with Love promotion, you can get an exclusive package of Designer Series Paper perfect for creating cards for family, friends, classmates, and more! From December 17, 2010 through January 24, 2011, get a FREE package of Bitty Buttons--a $4.95 value--when you purchase an exclusive Filled with Love Bundle. See details below. The other sneak peek is our new Red Glimmer Paper which two 12 x 12 sheets in the package. Love how much it sparkles -- the photos don't do this paper justice. The glitter/glimmer doesn't rub off and the sparkles is not coarse to the touch. Paper is flexible not rigid like so many brands. It only comes in Red, but will add a real WOW to your cards. Glimmer Paper, Red, item #121790 -- not available till January 4th. I'm so excited that in the Stampin' Up! 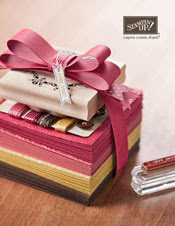 Occasions Mini we will have 1/2" seam binding ribbon in 7 colors!!! (Very Vanilla, Cherry Cobbler, Always Artichoke, Baja Breeze, Crumb Cake, Pear Pizzazz, and Rose Red). I'm showcasing the Cherry Cobbler one in today's blog post. Occasions Mini Catalog is valid January 4 thru April 30, 2011. This is a sneak peek at the ribbon and fabric brads. These cards used the tissue paper stamping technique. Seam Binding Ribbon used as an accent on this card. NOTE: Sneak Peek of one of our new fabric brads!!!!!! You will get 24 brads, 4 ea of 6 designs. They are gorgeous. I know I will use them often. Then I made sugar free banana bread, wrapped it in foil and easily tied it with our Seam Binding Ribbon. The ribbon is so easy to use. It is very lightweight and flexible. Wanted to share the recipe for the banana bread with you. It definitely can be doubled if you would like to make 2 large loaves. The bread freezes well too. Preheat overn to 350 degrees. Mash bananas in mixing bowl. Add sugar, eggs and oil, mixing well each time. Sift dry ingredients together and add to banana mixture. Pour in greased 5 x9 load pan and bake 55 - 60 minutes. December 14, 2010 Our latest digital downloads are here--and more are on the way for the month of December! If you would like to view our complete list of My Digital Studio download offerings, go to my website, then click on Shop Now, then Digital Crafting. I really like the "Extreme" stamp sets. In fact one of my cards for tomorrow's blog post uses the Extreme Guitar Player. When I was growing up, my mom used to package up most of the ingredients for 10 bean soup with a recipe and give to family and friends. Hal and I have done it a few years too, but not in ages. So yesterday we went to the store to get the ingredients. This is a quick and easy gift no matter what the occasion. I purchased 1 lb bags of beans and 1 box of barley. (barley is typically found over with canned soup not with the beans.) It made 9 gift jars. I used 1 quart Ball canning jars. They are a bit larger than needed, but the 1 pint ones would of been too small. I filled the empty space with green or red saran wrap. Stampin' Up! Fabric and Ribbon finish off the jar. More fabric and ribbon. I made a 7" cardboard circle template (traced a bowl) and cut out the Stampin' Up! Designer fabric. This is a close up of the layering. There are 10 types of beans in each container. I love the look of the texture and the colors. Each container will have a gift tag and a recipe. Here's the recipe for you too ... ENJOY ... it is a "meal" soup and great with crusty bread. Makes a large pot of soup, perfect for a family. Freezes well too. Simmer another 30 minutes. Makes a very large pot of soup. The soup is even better made a couple of days ahead and aged in the refrigerator. This is a reminder about my drawing on January 1st ... don't miss out on this. How would you like to have a chance to win a FREE copy of Stampin' Up! 's My Digital Studio? Each person who places an order thru me by the end of the day on December 31st will have at least once chance in the drawing. There will only be ONE winner in this drawing. My Digital Studio is a $79.95 value. It will work both on the PC and on a MAC. Use the same great artwork, colors, and accessory images found in our current product line to create personalized digital projects. The options are endless: create photo albums, calendars, and greeting cards using My Digital Studio. Once you've created your personalized gift or heirloom, have it printed in our high-quality print facility and delivered to your door or print it at home. There is NO LIMIT on the number of tickets you can earn for this drawing. There will only be one winner drawn on January 1st, 2011. Winner must reside in the US as we are only able to process orders thru Stampin' Up! for US customers. No alternate or substitution for this prize will be offered. Total prize value is $79.95 (before tax & shipping). This drawing/promotion is a personal promotion that I am offering and IS NOT sponsored by Stampin' Up! in any way.